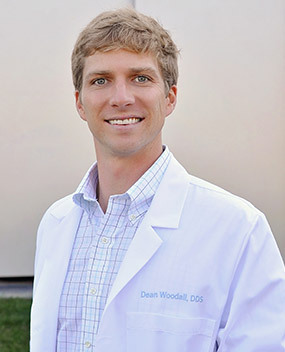 Dr. Dean Woodall was born and raised in Raleigh, North Carolina. Dr. Woodall earned his Doctorate of Dental Surgery in 2015 from the University of North Carolina at Chapel Hill, where he also completed his undergraduate degree. After graduating from dental school, Dr. Woodall returned to his hometown to practice, and in 2017, he joined his brother-in-law, Dr. Matt Norman, and Dr. Rob Allen at Raleigh Dental Excellence. As a trusted dental provider, what Dr. Woodall enjoys most about his job is building relationships with his patients and helping them select the best treatment options to meet their individual dental needs. Outside of his daily practice, Dr. Woodall pursues his passion for dentistry as a regular volunteer at the Wake Smiles dental clinic, a nonprofit dental clinic in Raleigh, and serves as vice chair on the organization’s board. He also attends extensive continuing education training to stay on top of the most current techniques and technology in dentistry. Dr. Woodall is an active member of the American Dental Association, the North Carolina Dental Society and the Raleigh-Wake County Dental Society. In his spare time, he enjoys surfing, playing golf, traveling, and spending time with his family.